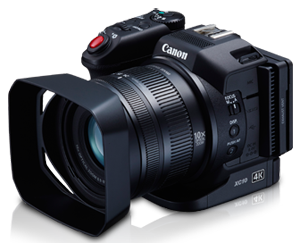 Canon XC-10 digital video camcorders supporting 4K resolution. 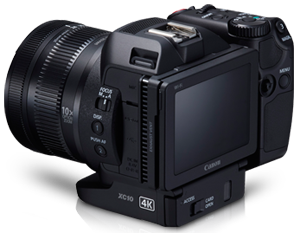 The Canon XC-10 capture high image quality as well as 4K Video format. The XC-10 mainly targeted for a professional photographers and amateur videographers. It also suited well on the wide range of the applications. You can use this camera as promotion video shooting, news gathering shooting, documentaries and use as a digital cinema sub-camera for high level of shooting. Canon making new technology for 4K video and High image quality as possible. Canon XC-10 makes use of the Intra Frame 4K video compression format, which achieves a maximum 305 Mbps bit rate, delivering a high data-compression rate without sacrificing image quality to contribute to reduced data volume. The new Canon XC-10 4K camcorder includes the same video recording formats as those employed in the Company's Cinema EOS System lineup of professional digital cinematography products, making possible stunning video results with minimal overexposure and underexposure even in extremely bright and dark areas of the imaging area. The The Canon XC-10 is also equipped with a slot for CFast 2.0 memory cards, a high-speed data-storage medium that enables the recording of 4K video without an external storage device. 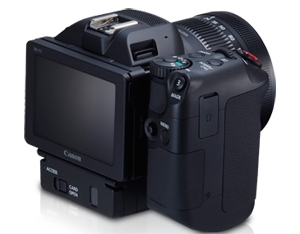 Supporting the capture of high-resolution still images, the Canon XC-10 incorporates an approximately 12.0-megapixel 1.0-inch CMOS sensor delivering a maximum ISO speed of 20000, and a mechanical shutter that eliminates rolling shutter skew even when capturing subjects moving at high speed. Furthermore, The Canon XC-10 4K camcorder includes a 4K Frame Grab, which allows users to extract approximately 8.29-megapixel photographs from 4K video recorded at 30 frames per second. Featuring a compact, lightweight body design, the new Canon XC-10 measures approximately 125 mm (w) x 102 mm (h) x 122 mm (d) and weighs approximately 930 grams. Additionally, it employs an LCD monitor capable of tilting upwards by approximately 90 degrees and downwards by approximately 65 degrees, and a grip that can be rotated on its axis by approximately 90 degrees both upwards and downwards. The XC-10's design allows users to shoot from a variety of perspectives and angles, supporting the capture of video in situations where a high level of mobility is essential. 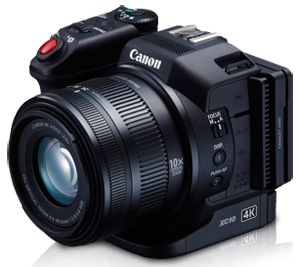 Canon develops new video format to support Canon XC-10 4K Camcorders. The new XF-AVC efficient recording for high image quality 2K, 4K and HD video. The XF-AVC mainly focused on professional 4K camcorders and delivers enhanced workflow with various stages of production system. The widespread use of digital data in cinema and video has become commonplace throughout the entire production workflow. Accordingly, amid growing demand for high-image-quality video, there have been increasing opportunities to record in 4K resolution video, which employs more than four times the number of pixels used in HD content. In light of this trend, Canon developed its XF-AVC video format to support greater workflow efficiency and convenience during the production process for high-image-quality video.